It seems every week I get mail from Comcast trying to get me to sign up again for their service. I had comcast a while back and decide to cancel it and switch to AT&T because they have better rates and you don't have to bundle the internet service with tv. It is really getting annoying because it is so frequent and it looks the like same thing. I say looks because I don't even open them anymore. I just tear them up immediately. 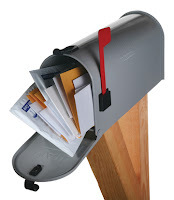 I have looked into trying to get them to stop sending junk mail, but there does not seem to be an easy way. A search on the internet has shown other customers who are also fed up with junk mail from Comcast. The excuse there was that they think someone new might move in and they want the new resident to get their offer. Ok fine, no problem, but do you have to send it every week? People don't move that fast. Comcast, I can tell you I am not moving for at least a year, and probably many years after that, so you can stop wasting your money on postage sending me this junk. I decided to call the number on the last mail they sent me, after going through several menus and not have the option to choose anything related to getting off the mailing list, I decided to email them. This again was not easy. After browsing around the site for a few minutes I managed to find an email contact for general questions. I requested to be taken off the mailing list. Today I received a reply from Comcast. It was a rather long email for such a simple question, but they did say they would take me off the list but that I might still get mail from them for the next 1 - 2 months. We'll see. If it keeps coming, you will hear about it here. UPDATE 10-7-11 Still getting junk mail from Comcast. UPDATE 4-7-15 I still seem to be getting mail from Comcast as well as AT&T every week trying to get me to sign up for new services. It should not be so hard to unsubscribe from all of these things. The local cable comissioner wouldnt help me with this either, she said "we dont deal with marketing issues you really have to take that up with the post office" yet on her website complaint form there is a check box for "marketing" issues. This is the biggest pain. Box up your Comcast junk mail and send it to the President and CEO Neil Smit Jr. 220 Glenn Rd. Ardmore Pa 19003-2512. This is his home address. Remember to include a heated letter. Still getting weekly junk mail from Comcast. I was on hold a little while after tranferred to the correct department. A nice gent took my address only and verified I have been removed from the list about a min later. We'll see how it goes. Good luck. I'm still getting junk mail from them.